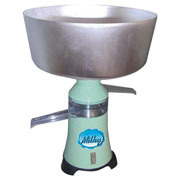 Milky Electric Cream Separators are extremely quiet, well-designed and feature quality materials and workmanship throughout. Milky Electrics use the familiar spinning disc technology, but with features that improve safety, balance and durability. The fully electronic control starts the Milky smoothly and reaches full output only after about 30 seconds, putting less stress on the motor. The attachment design of the milk tank along with the broad rubber feet give additional stability. The spinning disks are made out of aluminum, the milk container is aluminum, and the housing and milk and cream spouts are made of food-grade plastic. NOTE: Milk separators are not recommended for use with high-butterfat milk such as that of Jersey cows. Capacity 85 Liters (90 Quarts) per hour. Weight 9 lbs. © 2019 Jaybee Precision Made in U.S.A.